Tobacco fragrances are one of my favorite styles of scents. Some of the best tobacco fragrances are Havana, Tobacco Vanille, and Chergui. The beauty is that there are so many different styles available. While some may play a large role in the overall composition, others play the lead. Hopefully, our list can bring provide some insight into some of the best scents available. A very clean and fresh fragrance, Havana for Men by Aramis has notes of tobacco, oakmoss, cinnamon, carnation, rum, cedar, and tonka. This is more of a dry tobacco fragrance, and it has a very “outdoors” quality to it. Most people would consider this to be a “manly” cologne. Picture a well dressed gentleman with a cigar, and you have Havana. The great news is that it is very inexpensive, and if you are looking to add a low cost tobacco fragrance to your collection, you can check out the price at amazon. You won’t be disappointed, and it is not big setback on cost if it is not your cup of tea. Dreamer by Versace is a clean, floral, herbal fragrance with a tobacco dry down. It has notes of iris, lavender, sage, tonka, and tobacco. There is almost a soapy barbershop vibe to Dreamer. One fragrance that comes up a lot when people first smell it is D&G Pour Homme. The drawback to this fragrance is poor performance due to reformulations, but certainly not everyone feels this way. Pure Havane is a very popular fragrance that was released in 2011. It is probably one of the best know flankers in the A Men collection. Many people who dislike the A Men line love the scent of this one. It smells like sweet honey, chocolate, and tobacco over a hint of vanilla. It is a perfect blend of boozy tobacco goodness. This is a great scent for the cooler weather, and if you have never tried it, do yourself a favor and give it a shot. Even Amazon reviewers have great things to say about this tobacco fragrance. Tobacco Vanille is one of the most popular Tom Ford fragrances on the market. 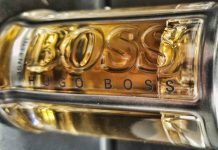 It is listed as a unisex fragrance, but it is definitely masculine enough for most men. It has notes of tobacco, vanilla, dried fruits, cacao, and spices. This fragrance is an interpretation of the scents at a gentlemen’s club. Notes of warm aromatic pipe tobacco with whiffs of vanilla and spices. The performance on this scent is Beastmode, as it lasts a long time. It is not unusual to get 12 plus hours out of this. Because this is a Tom Ford fragrance, it comes with a Tom Ford price tag. Amazon carries it on Prime, and you can check its current price here. Because of the scent and price tag, it makes for a great special occasion fragrance. If you have expensive tastes in fragrances, and have not tried this one yet, you should. Spicebomb by Viktor & Rolf was released in 2012 as the male equivalent to Flowerbomb. It has notes of cinnamon, bergamot, pink pepper, tobacco, and leather. It was created by Perfumer Olivier Polge. This is an extremely popular fragrance, and if you are new to fragrances, this is a great choice to get you started in tobacco scents. A great description of this would be sitting on a leather couch smoking a pipe by the fire during the holidays. Now, imagine someone is preparing a hot drink with spices in the kitchen. That is Spicebomb. Being a sweet, spicy, and leathery fragrance, this makes for a great Fall and Winter choice. London for Men by Burberry is like Fall in a bottle. Think cinnamon, leather, wine, and tobacco. It truly is perfect for the season. While it is not a tobacco dominant fragrance, it definitely plays a role in the composition. If you are looking for a warm, spicy scent for Fall or Winter, London for Men fits the bill. Chergui is a very mysterious fragrance that is listed as unisex. Many men will comment it is too powdery, and many women will comment that it is too masculine. It is reminiscent of a dry eastern wind, and the note of hay is what makes this fragrance so unique. It’s not really a safe scent, and it is definitely something to wear if you want to stand out in the crowd. It has notes of tobacco leaf, honey, iris, hay, and sandalwood. 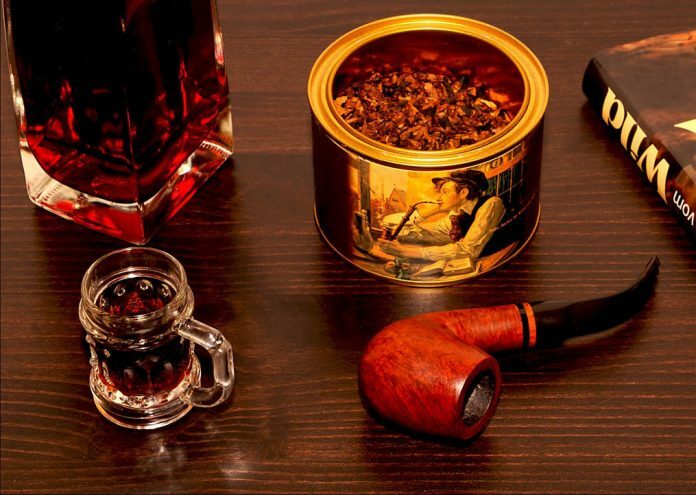 This is a combination of spicy, powdery tobacco with warm amber. The notes blend well together, and no note seems to overpower the others. The performance on the scent is very good, and it lasts a very long time. If you like sweet honey and cherry pipe tobacco, then you should try out Back to Black By Kilian. Honey and cherry tobacco are prominent, and it does have notes of vanilla and tonka. 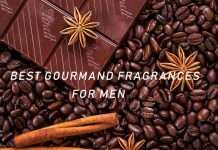 Because of its sweet goodness, this also made our list of Best Gourmand Fragrances. This is a great fragrance for a night out, but probably not the best choice for the office. If you are looking for a sweet cherry tobacco note, Back To Black should be your next purchase. The notes on this fragrance are incredible. It has notes of whiskey, coriander, benzoin, tobacco, oud, and tonka. I think of dark, dry, and seductive every time that I smell this. While it does receive a lot of good compliments, it also receives a fair bit of negative comments as well. But, if you are confident, and you want to get noticed, the Tobacco Oud is a good choice. This would make for a great formal fragrance, and it is perfect for the cooler weather. Tobacco Oud can be picked up at FragranceX. Herod was launched in 2012. This is a fairly versatile fragrance as it is sweet enough to wear casually, and elegant enough to wear at night while dressed up. It opens with sweet notes of vanilla and cinnamon, and is followed by a classy scent of tobacco with smoke and incense. The smoke and incense probably comes from Nagarmotha. If you have ever smelled this essential oil, it has smokey and leathery notes to it. Because of that, this works well for someone who is confident and does not mind being noticed. When it comes to the scent of tobacco in this fragrance, it is very fresh and moist. Herod by Parfums de Marly is offered on amazon, but the price may be a little too high for some. Enigma Pour Homme or Creation-E is a masculine fragrance that was launched in 2013. This fragrance notes are cognac, tobacco, vanilla, and spices. Many people reference the scent of cola when first smelling it. While the note profile is amazing, unfortunately, most people will not consider purchasing due to its price. In addition, some people find it too animalic. Having said that, it is a very unique and mysterious fragrance that comes off masculine, but many women wear it as well. If you have the budget, and if tobacco fragrances are your thing, you should try this out. We have listed only a handful of some of the best tobacco fragrances available. We chose a range of styles and costs. We also tried to include different versions of tobacco notes. Some are green, some are moist, some are dry, and some are spicy. Hopefully, the information provided can help bring awareness to some of the different choices available. Please comment below on your favorite tobacco fragrances.